After serving in the US Navy, David began running PCA HPDE events and also joined a Karting league, where he started winning his first competitive races. A chance opportunity to obtain a novice license with IRDC in 2015, meet all the great drivers and volunteers, then renting a PRO3 car, was all it took to get him hooked. Track car soon sold, he purchased a PRO3 car by fall of the same year. Begining in 2017, David campaigned PRO3 #6 in historic "FINA" livery (2 & 4-wheel racing legend Johnny Cecotto's 1992 DTM season #7 entry), as a tribute to the glory days of the E30 chassis and the German DTM series. I’ve always loved racing, and just being competitive. In 2004 I began falling into the E30 scene pretty hard and began learning to drive better at lapping days. By 2005 I had turned my E30 into a full track rat and had won two small time Gokart endurance races. In 2009 I opened up my own shop (Accuracy Automotive) and in 2010 built my own PRO3 car. I finished my first full season in a shoot-out for 3rd overall but had to settle for 4th. But I picked up my first Win in PRO3! I am always working on driving very hard and clean. I like to make sure whoever is in front of me feels the pressure of me being there. My long term goals are to win a PRO3 championship. Podium at Thunderhill 25, and one day race on any team, even a small one, at the 24 hours of Le Mans. I moved from Canada in 2011 and quickly discovered Pacific Raceways. A few track days and Proformance School sessions later I rented a Hill brothers PRO3 car and was hooked by turn 3b. With the help of Kevin Doyle and the fantastic PRO3 community I built a car and started racing in earnest in 2015. With my sister Val as pit crew, we're having a great time touring the west and driving fast. I grew up watching orange Mustangs and blue Camaros battle at Lime Rock for Trans-Am supremacy, Jones vs Donahue. Stewart, Rindt and Hill were far away legends before I ventured to Watkins Glen in the autumn. 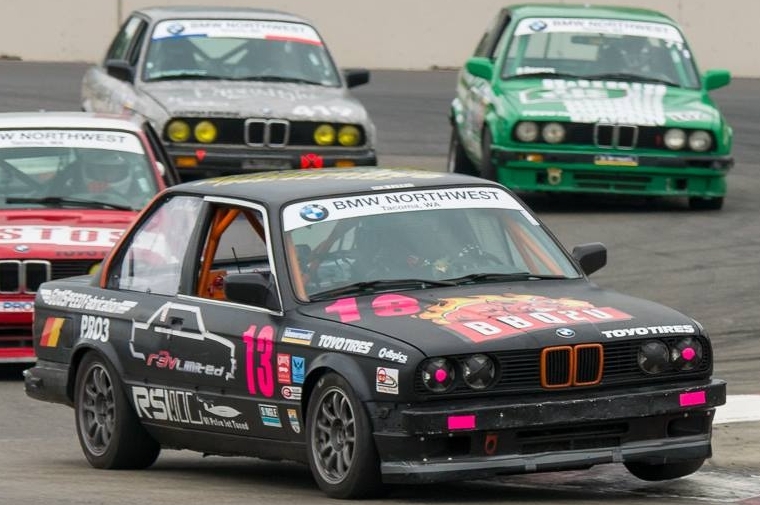 Lance started racing BMWs in 1999 after years of lapping days with the Puget Sound BMW Club. Lance’s PRO3 car is one of the first four BMW E30s that raced in the first PRO3 season after being converted from ITS specs. Lance has held the lap record for PRO3 twice at Pacific Raceways. By day Lance provides residential architectural design services and when he has an extra moment helps with administration and promotion for the PRO3 Series. Sarah spent most of her life thinking that cars were a great way to get to the grocery store. In 2013 she did a novice HP day at Proformance and spent most of the night driving Pacific Raceways over and over and over in her head. A year later, after many lapping days, she got into a PRO3 car and realized how ridiculously fun it is to drive a proper racecar on the track. Even better is when that racecar comes with a built in family that offers friendship, a challenge, and great wheel to wheel racing. There is no way she could do this without the support of her husband Charlie (who shares #79) and Kevin Doyle at KD Automotive. Started road racing with the ICSCC in 1992 in a Ford Fiesta (1994 I-Production champ – so don’t laugh), and later a Mazda RX-7. 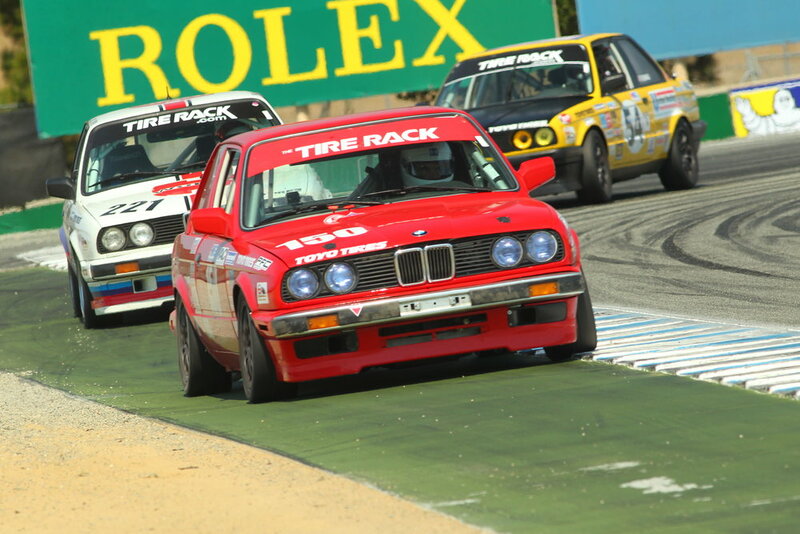 Then I discovered racing in a real driver’s car, a BMW 2002. By the mid-2000s competition in the ’02 got a little thin so in 2007 I made the logical jump to Pro-3. With the help of a donated shell my 1990 E30 (frau Blue Car) became the 7th race car I’ve built and raced and it’s by far my favorite. Nothing is better than tight racing in a full grid of closely matched cars and Pro-3 is the place to be. Brad has been racing over 25 years and with a recent 3rd place finish in the PRO3 season championship driving his #81 Kuni BMW, he is poised to again be on the podium this season. As a Periodontist, Brad is routinely involved in treating the oral complications of diabetes (www.PortlandImplantDentistry.com). Mark Estes started racing PRO3 in 2009, he is from Beaverton Oregon. He loves racing BMW's which is a dream come true. Mark also enjoys the camaraderie that is a part of the PRO3 family. Eric started racing in 2005 with this car in a different class, and it has over 30,000 miles since its first race. Eric has also raced in the grueling 25 Hours of Thunderhill, 5 times. He has tested a NASCAR at Portland international Raceway, and tested with C360 at Daytona international Speedway. Chuck started out attending local BMWCCA lapping days in 2007-2008 and soon found the addiction to Racecars after building his PRO3 car for 2009 Season. He is the owner of Grip Racing, a racecar transportation and Maintenence shop which was started in 2011. Now that he has a few seasons in a PRO3 car he is going to campaign a SpecE46 for the 2014 season in addition to the PRO3 car. My interest in racing began while my father was racing sports cars in the 60’s and 70’s. I started racing with ICSCC in 2000 with an I Production Datsun. I built my PRO3 car over 2011 and moved up to racing PRO3 in 2012. Besides PRO3 sprint racing, I also enjoy ICSCC endurance racing. I enjoy working on and maintaining my own cars. I have restored and own several classic cars. I’m part owner and driver with a Chumpcar team called Shoe String Racing. A couple of seasons of BMWCCA lapping days in a 2002, and I was hooked. An underused 2002 race car came up for sale at an opportune time, so I took it racing. And gave it a few new dents. And a new nose... engines... transmissions... a dozen differentials... After racing around the PRO3 pack for nearly a decade, common sense prevailed, and I finally built a PRO3 car. The Hill brothers, Bill Spornitz, Greg Miller, Tom Olsson, Mike Olsen, Rico Chiarelli and many others have provided 'irresistible deals' on cars, parts, and an immeasurable amount of support, help and encouragement. Known primarily for his orange Crocs, warped humor, spectacular off’s, destruction of the legendary Oscar, and as current holder of the coveted IRDC Chateau Bonzo trophy–Jim Cissell didn’t get his start at racing until 2009 at age 61. Many feel that wasn’t a long enough wait, including his former occasional co-driver son Jamie #309. Jim finished 11th overall in 2015, 8th in 2015, and 7th in 2016. You can see some of Jim's work and Race season summaries on the PRO3 Video page. Duncan has been racing in PRO3 since 2010 and loves the on-track competitiveness and off-track friendliness of the PRO3 class. When not racing, he loves to ski, cycle, and kiteboard. He lives in West Vancouver, BC with his wife and dogs. Michael Olsen is the driver of the Spirit Halloween PRO3 #130. Michael has been a part of PRO3 since 2005 when he built the car in his garage with no previous experience building a racecar. With over 70 PRO3 race starts, 12 podium finishes, and 10 endurance race starts, Michael has established himself as one of the “regulars” within the rapidly growing class and is generally found wandering the paddock during race weekends laughing and joking with his competition. Michael is a commercial real estate agent residing in Gig Harbor, WA, with his wife, Melanie, and their two children, Joseph and Danica. Bill made the progression from Driver Skills to HPDE to Club Racing over 5 years. I went through ICSCC race school in 2015 and ran full time starting in 2017. I instruct for the PCA/BMW/AUDI Clubs and at The Ridge Racing School now, where I get to introduce newer drivers to the fun and excitement of high speed driving. PRO3 was the obvious choice for me as a driver since I love BMWs and the people were so welcoming. Martin has been racing since 2002, starting in small bore FWD cars. In 2009 he went looking for a new racing series, and tried racing in a few different cars including Spec Miata and PRO3. The cast of characters that make up the PRO3 group, the camaraderie, and the level of competition on track sealed the deal, and the decision to build a PRO3 car was made. While it’s been a humbling experience, it’s been fun from day one. James had had a passion for the E30 platform for over 10 years. Owner of R3VLimited.com, he has spent a large majority of his car passion keeping these enthusiast preferred vehicles on the road. In 2009, James began with simple AutoX and Lapping days with the BMW Car Club, and quickly grew his passion, from Lemons Racing, to Chumpcar, and in 2012 to ICSCC PRO3. James hopes to join the ranks of GrandAM at some point in his future, until that day comes you can find him at home ICSCC conference race weekends. Ryan is a relative latecomer to racing. He completed his novice in 2007 in a rented GTL Honda, placing first in class overall in his first season. Running in club races at Mission, Ryan has had seat time in a Koni Challenge 996 and a SPEED World Challenge BMW 325is. As a part of his charitable work at the track, Ryan was the co-founder of The BMW Store Children's Charities Grand Prix which has raised over $130,000 for BC Children's Hospital and Children's Wish. As a part of that work, he began racing at Thunderhill in 2008 with the BMW Store Team in the 25 Hour race and has returned there 6 years in a row. 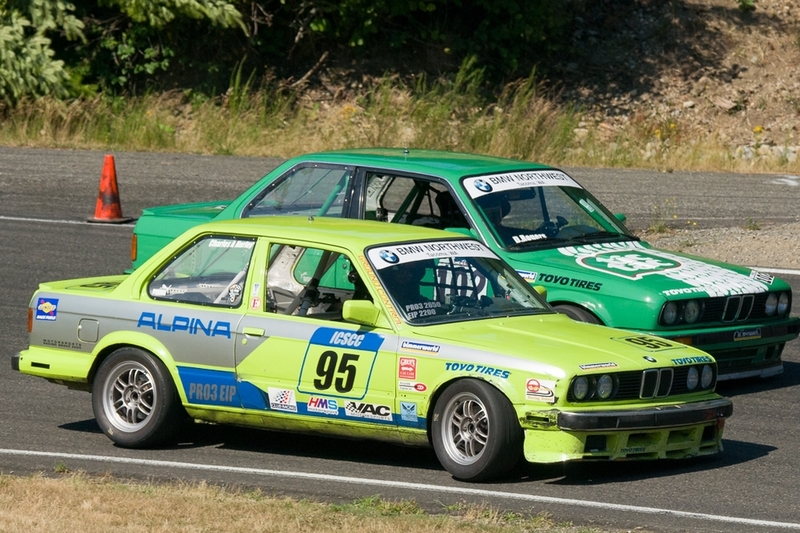 In 2014, Ryan will run his 1987 “Avanade” BMW 325 in PRO3 and a 1985 IMSA Chevy Camaro in Vintage events. David started racing in 1995 with an AE86 Toyota GTS in the Proformance Racing series and tried everything from an open wheel formula V to V8 powered stock car before coming to the PRO3 series. The competition and camaraderie is really what drew me to the series. However, it was not until a few good friends already in the series pushed me, that I made the jump. After all, I could not let them have all the fun! 2013 was my second full year in the series finishing seventh in the championship. I cannot think of a better way to spend my kid’s inheritance. Russell started road racing in 2010 after driving in Solo and Hill Climb events. In 2014 he moved to PRO3 from Conference Production because it offered the close competitive racing that makes the sport fun and rewarding. He is looking forward to improving on 2015 PRO3 Championship Season 4th place and personal best 3rd place race finishes. Daniele has been racing since 2011 when she joined the PRO3 group. She drives the Wurth car that she built with her husband, Brian (PRO3 # 227). "Cars and driving have always been a passion. I am very glad to be part of PRO3, it is a fantastic group, everyone is friendly, the racing is close, the cars are awesome.. This is a dream come true." A life-long motorsports fan, Beef finally seized the opportunity to become a participant by graduating from the ProFormance Racing School competition course in 2010. After completing his licensing requirements in 2011 and earning the IRDC Novice of the Year Award, he ran a partial race schedule the following year. The 2013 season was a breakout one for Beef, as he was able to qualify for end-of-year Championship points, finishing 11th overall in PRO3 and a 4th place in the EIP class standings. The thrill of competition and the great camaraderie will keep Beef an active participant in PRO3 well into the future! Kevin Ormiston started racing in 2013 after completing the novice program. In college he decided it was finally time to gain some practical experience and build a car. He enjoys the supportive nature of PRO3 and the variety of tracks available in the Northwest. His favorite thing about PRO3 is that there is great racing everywhere in the pack. Outside of racing, he is just starting his career as an attorney. He looks forward to racing for years to come.